The Nomad2Go is a portable power cleaner capable of producing a 90 psi jet stream or soft misty spray and is great for cleaning off your dirty outdoor gear before the wife sees it in the car or in the house. 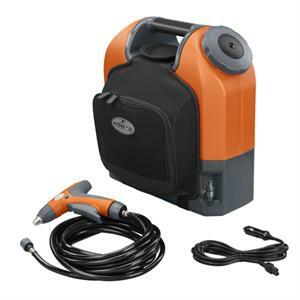 This portable power washer is available as either an 18 volt rechargeable battery option or 12 volt plug directly into your car option. The Nomad2Go is convenient and works great for cleaning that muddy mountain bike or dirty cyclocross racer. Now, here are a few tips for cleaning your bike with a Nomad2Go! Using the Nomad2Go on its spray setting, rinse your bike, being careful not to push dirt into the bearings, pivots or brake pads. Using a combination of soft brushes, and sponges or a towel, go over the frame, drivetrain, brakes, suspension components, pedals, and pivots. Return to your Nomad2Go (remember your spray setting), spray away the loosened dirt. Then apply a degreaser to the chain and use a claw brush to remove any dirt that has clogged itself between the cassette cogs. Gently spray the drive train while spinning the cranks to once again remove the dirt. Bounce the bike a few times on the ground to shake the water off. Wipe everything down with a clean towel and apply chain lube below the chainstay. Applying the lube below the chainstay will help keep it on the chain and off your rim. Now you are all set to race again! More bike cleaning tips from Park Tool and the BicycleTutor.